Prior to 1834, a number of parish workhouses existed in the Whitehaven area. In Whitehaven itself, a workhouse was built in 1743 on Scotch Street. It was enlarged in 1795 to accommodate 200 inmates, perhaps following Whitehaven's incorporation as a parish under Gilbert's Act of 1782. The township of Preston Quarter had a workhouse at Ginns. In 1795, Harrington parish began to send its poor to the workhouse at Workington. Cumberland: Arcledon, Beckermet St John's, Cleator, Distington, Egremont (2), Ennerdale and Kinniside, Gosforth, Haile, Harrington (2), Hensingham, Lamplugh, Lowside Quarter, Moresby, Nether Wasdale, Parton, Ponsonby, Preston Quarter (3), Rottington, Sandwith, St Bees, St Bridget's, Whiddicar, Whitehaven (6). The population falling within the Union at the 1831 census had been 27,816 with parishes ranging in size from Rottington (population 45) to Whitehaven itself (11,393). The average annual poor-rate expenditure for the period 1836-38 had been £5,775 or 4s.2d. per head of the population. Initially, the Whitehaven Union continued to use the existing parish workhouse buildings in Whitehaven (used for female inmates) and Preston Quarter (for males) each of which could accommodate around 200. In 1854-5, a new Union workhouse was built on a three acre site at the south of the town on the west side of Low Road (now St Bees Road). Constructed from red sandstone, the two storey building was designed by a Mr Porter of London and adopted the then common corridor plan. It accommodated 424 inmates and cost £8,000. The workhouse also boasted four acres of gardens on which the inmates cultivated vegetables. The workhouse location and layout can be seen on the 1899 map below. In 1894, a competition was held for the design of a new 75-bed infirmary and was won by G Dale Oliver. The new building was erected to the north-west of the main building but was not finally completed until 1905 at a cost of £10,000. After 1930, the workhouse was renamed Meadow View House. It later became a long-stay geriatric hospital. Following subsidence because of mine workings, the property was vacated in the early 1960s and was demolished. A 1965 photograph of Meadow View can be found on the Whitehaven Born and Bred web site. Whitehaven Union operated children's cottage homes at St Bee's and at Harrington. 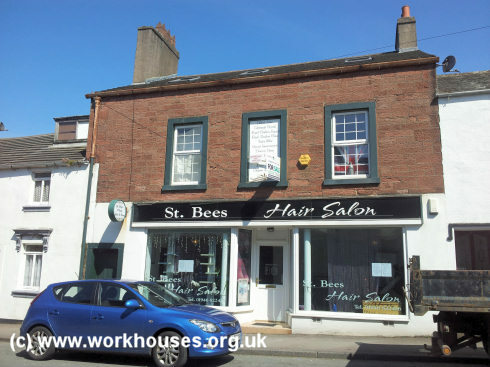 The St Bee's home was opened in 1915 in the former village policeman's home at 24 Main Street, now a beauty salon. Children from the home attended the village school. Former St Bee's children's home, 2012. The Harrington home, which was for Roman Catholic children, was at 26 Rose Hill, Harrington. 1914 — Master: Harry Dixon; Matron: Mrs H Dixon. Whitehaven Archive and Local Studies Centre, Scotch Street, Whitehaven, Cumbria CA28 7NL. Holdings include: Guardians' minutes (1860-1931); Admissions and discharges (1893-1962); etc. Bygone Whitehaven by Michael and Sylvia Moon (Beckermet Bookshop, 1976). Thanks to Bob Jopling for information on the St Bee's home.